"Fool me once, shame on you... but teach a man to fool me, and I'll be fooled for the rest of my life." "I Thought I Was The Only One Who Hated Social Injustice—Then This Lionhearted Woman Started To Sing." "Watch This Rad Tween Beautifully Explain Why Children Should Not Be Sold Into Slavery. He Nails It." "Why Haven't You Heard About Everyone And Everything That's Amazing? This Wonderful Graph Sums It Up." Name either the account these tweets come from or the website they spoof. "I love it when someone's Twitter bio says something like 'Mother. Wife. Sister. Human. Warrior. Falcon. Yardstick. Turban. Cabbage.' etc"
Who tweeted this and subsequently used the list of biographical appellations as the subtitle of his 2013 memoir? Dumbass nerd lol." Who is the "some guy"? Supply the application name redacted from this Rachel Lichtman (@rachelichtman) tweet of March 2013: "Before like two weeks ago if you said 'Follow me on [redacted]' you were Tarzan." In a joke more than twelve years in the making, who tweeted, "I knew American Idol would never last without me #CANCELLED" in May 2015? In May 2013, Cee Joyner (@ceejoyner) tweeted that "garbage men should switch names" with what group? This community includes Julien Blanc, Roosh V, and The Layguide author Tony Clink. In May 2012 Parks and Recreation writer Megan Amram (@meganamram) tweeted, "WHY was Mario Kart not called" what pun on the name of the band that released the album Hi Infidelity? Hyperthymesia is the extremely rare ability to recall the vast majority of one's life. The name of what hyperthymestic actress has been redacted from this Michael McKean (@MJMcKean) tweet of December 2013: "Mention any date in the last 25 years & I can tell you whether or not I ran into [redacted] that day"? In March 2014 what high-pitched English singer, then age forty, tweeted, "Can't believe Justin Bieber's balls dropped before mine"? In August 2013 the White House (@WhiteHouse) tweeted the photo seen here. 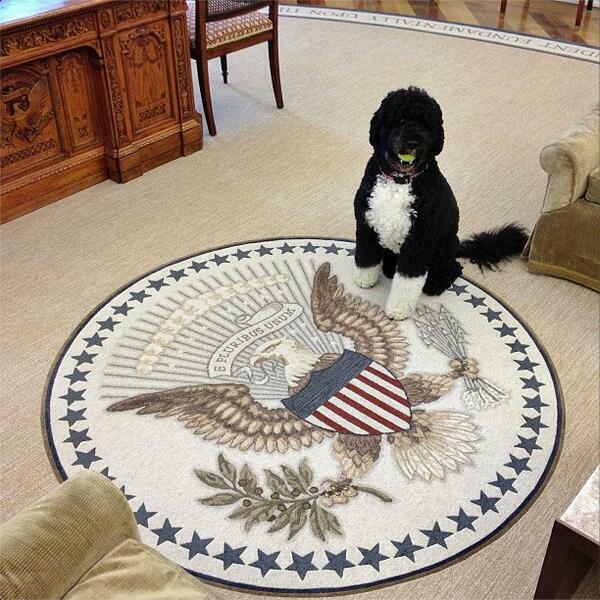 The caption, "Bo, stop trying to make fetch happen," is an allusion to what 2004 film? "There will b weather in Iowa today So I'm flying bk to DC early"
"Work on farm Fri. Burning piles of brush WindyFire got out of control. Thank God for good naber He help get undr control PantsBurnLegWound"
"Quit complaining abt my Twitter shorthand I know how to spell But Twitter limit is 120 characters"
These unintentionally funny tweets are the work of what current member of the United States Senate? Supply the band name redacted from this Dave Horwitz (@Dave_Horwitz) tweet of June 2011: "Comedians should stop trying. Nothing will ever be funnier than the part in that [redacted] song where the guy asks, 'Am I sexual?'"